← The Rules of Brand Strategy, Part One. Be amazing at the one thing you promise. Every time. No exceptions. You have a lot of options for your brand story. You get to explore different ways to deliver your service, how your culture fuels the brand experience, how leadership pushes new boundaries and how you continue to engage and excite your stakeholders. It’s your brand; it’s your story to tell. Every story, though, is based on a familiar plot. Just like an action story needs an adventure or a love story needs a romance, a brand story must live up to the core promise. If your brand can’t manage that one thing, nothing else matters. Too often brands get caught up in the elements that make the brand unique but drop the ball on the one simple thing that anchors the relationship. Poor leadership gets in the way— it’s either laziness (just too uncommitted to care), complacency (believing people will judge the brand on intent and flair rather than action and results), or ignorance (having no clue about expectations). Brand Strategy always starts with clarity about your capacity to do the one thing you promise. Without a solid grasp of this reality—and a commitment to deliver an uncompromising experience—success is simply out of reach. Photo Note: I snapped the accompanying photo in 2004 during a vacation in Oregon. In 2011, while traveling the same route, I couldn’t find the business. 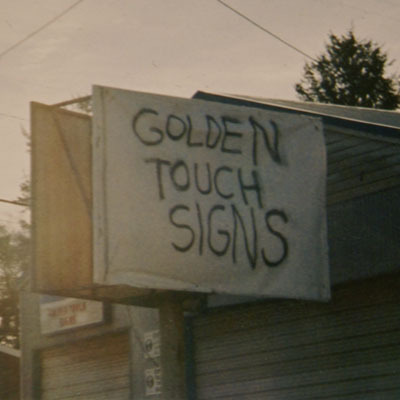 Not surprisingly, Golden Touch Signs is no longer in business. A keen eye will notice the company name in red letters over the door; another fine example of this company’s stellar work. This entry was posted in Best Practices, Strategy and tagged Brand Experience, Brand Story, Rules. Bookmark the permalink. Thanks for reading. Again, possibly.